And more being sent their way. via U.S. Shoots Itself In the Foot By Accidentally Arming ISIS – Yahoo News. Last weekend, the new Iraqi prime minister, Haider al-Abadi, gave Iraqi state television the first detailed accounting of those lost weapons. 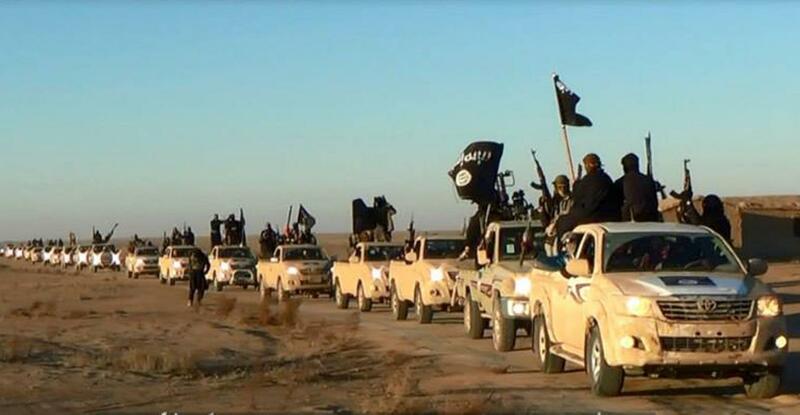 Some were old or barely functioning, but others were in good shape and of great value to the ISIS militants. According to Reuters, the U.S.-made weaponry that fell into enemy hands including 2,300 Humvee armored vehicles, at least 40 M1A1 main battle tanks, 74,000 machine guns, and as many as 52 M198 howitzer mobile gun systems, plus small arms and ammunition. ISIS added to its armada of captured U.S. military vehicles and tanks when Iraqi Security Forces fled the provincial capital of Ramadi late last month and left behind their equipment, according to Military.com. A Pentagon spokesman said that some artillery pieces had been left behind, but he could not say exactly how many. He said about 100 wheeled vehicles and dozens of tracked vehicles were lost to ISIS when the last remaining Iraqi defenders abandoned the city, which is 60 miles west of Baghdad. To help replenish Iraq’s motor pool, the U.S. State Department last year approved a sale to Iraq of 1,000 Humvees, along with their armor upgrades, machine guns and grenade launchers. The United States previously donated 250 Mine Resistant Armored Personnel carriers (MRAPs) to Iraq, plus unaccountable amounts of material left behind when American forces departed in 2011. The United States is currently in the process of moving to Iraq 175 M1A1 Abrams main battle tanks, 55,000 rounds of main tank-gun ammunition, $600 million in howitzers and trucks, $700 million worth of Hellfire missiles and 2,000 AT-4 rockets. The Hellfires and AT-4′s, anti-tank weapons, are presumably going to be used to help destroy the American armor in the hands of Islamic State. The United States is also conducting air strikes to destroy weapons seized by Islamic State. It’s a surreal state of affairs in which American weaponry is being sent into Iraq to destroy American weaponry previously sent into Iraq. If a new sequel to Catch-22 were to be written, this would be the plot line. The United States also continues to spend money on training the Iraqi military. Some 3,000 American soldiers are currently in Iraq preparing Iraqi soldiers to perhaps someday fight Islamic State; many of the Americans are conducting the training on former military bases abandoned by the United States following Gulf War 2.0. In addition, some $1.2 billion in training funds for Iraq were tucked into an omnibus spending bill that Congress passed earlier this year. This is in spite of the sad reality that from 2003 to 2011, the United States spent $25 billion training Iraqi security forces.